Apologies for the quality as I only had my phone. I like it - perhaps our forces need something like this to stop them crashing into people and hitting pedestrians in their high speed pursuits. They do have helicopters after all for that. Not much room for prisoners, but I like it, too! It is very postman pat isn't it. Was it electric do you know ? 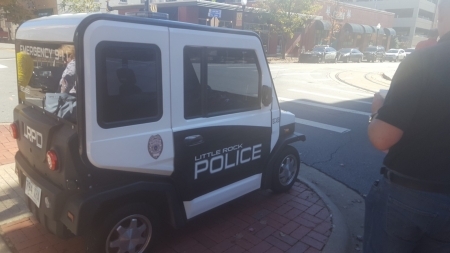 We couldn't tell if it was an EV, we thought so but it didn't move. Based around one of our old milk floats? Looks like its golf cart based. We have a smaller one, electric, will do 35mph and has a 30 mile range. Road ready with headlights, brake lights and blinkers. Lots of fun.